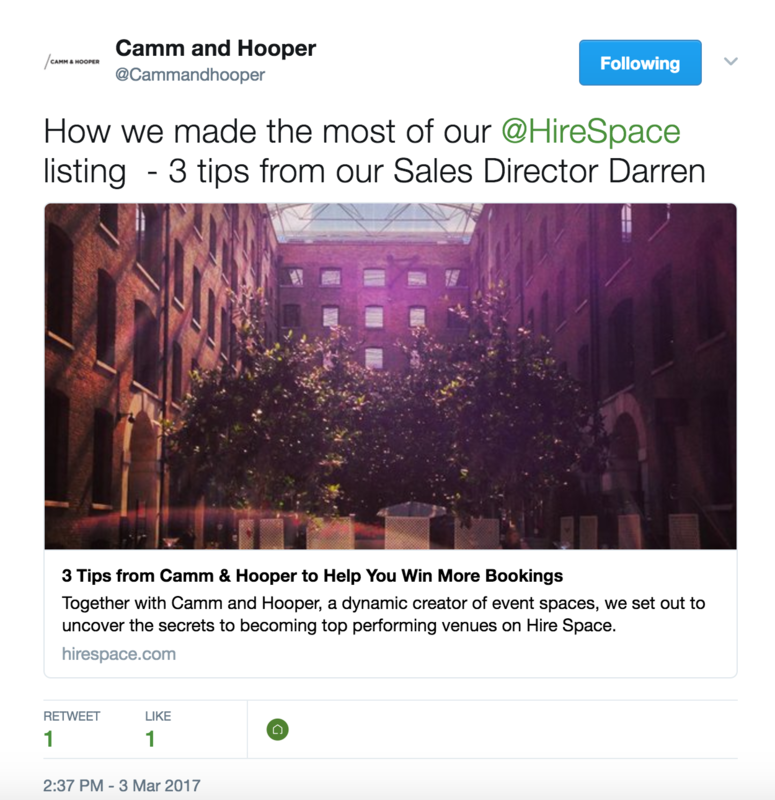 So you've been featured on the Hire Space blog. What now? 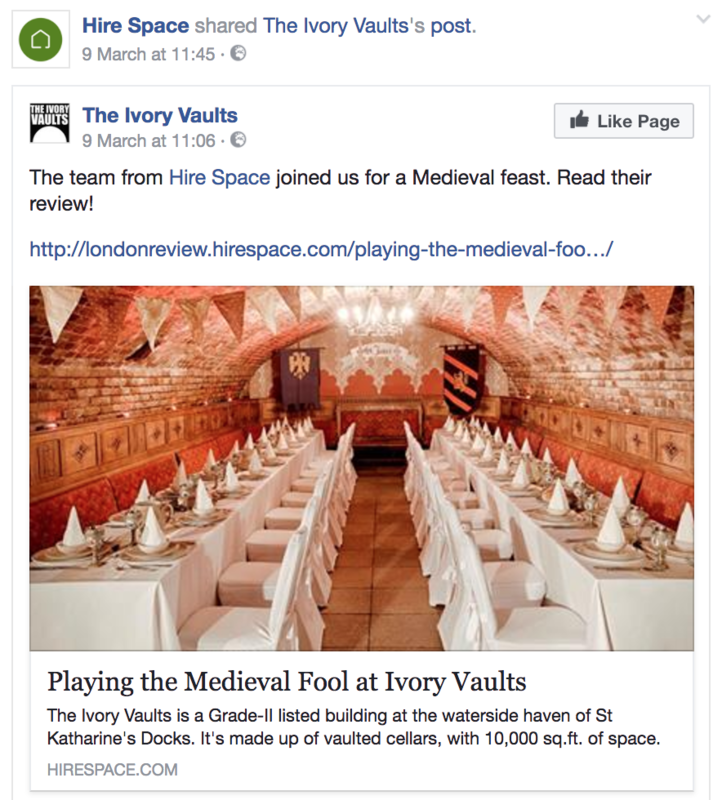 You've been featured on the Hire Space blog – woohoo! Hire Space promotes all of its blog content to its community of 100,000+ venue bookers, so you can be sure that lots and lots of people will read the feature. You're always welcome to ask us how we've promoted it – it's what we do best! Third-party endorsements are a fantastic way to turn idle browsers of your website into full-blown customers. Depending on the blog title, many venues choose to say something like: "Our venue is a renowned venue for hire, and was recently chosen as one of London's best event venues", with the "London's best event venues" part linking to your feature on Hire Space. This recommendation will tell Google that you approve of the content. The feature will appear higher up on the page when people search Google for blog features like ours, resulting in more relevant readers for your venue. Linking from your homepage is the most effective method, but some venues choose to link from the "Venue Hire" or "Blog" sections of their site. For support on linking to your Hire Space content from your website, please email marketing@hirespace.com with subject line "Help me boost my content". The Hire Space brand is trusted by over a million venue bookers a year. Shout about your Hire Space feature in your newsletter and social media to grow trust in your own brand, too! This will amplify your post to another 40,000+ venue bookers. If, for some reason, we fail to amplify your post, just let us know - and we'll do it twice to make sure! Now over to you. Following these simple but proven-to-be effective steps will increase the impact your exclusive content hugely – meaning more exposure, more enquiries, and more bookings for your venue. We're always delighted to talk through any of the above, or offer support. Just give us a shout at marketing@hirespace.com.